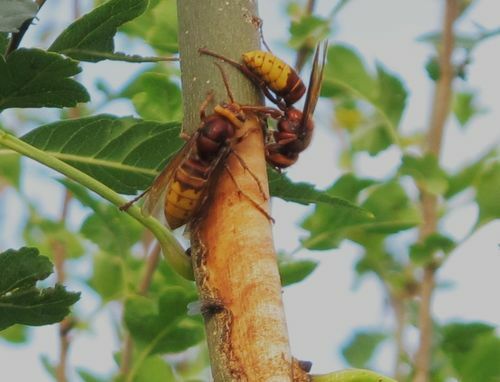 On 10 September 2013 I discovered a number of hornets Vespa crabro on young (this year's) growth of Ash Fraxinus excelsior in the mainly hawthorn hedge opposite my house. They were attacking the bark, stripping it, and as far as I could tell, drinking the sap. I have been able to observe them daily for nearly four weeks. When I first found the hornets this activity had clearly been going on for some time as the damage to the bark was already extensive. Judging by the speed at which they have since been stripping the bark, I would guess that they had been there for at least three weeks before I found them. The damage was spread over five shoots and now consists of three long (12-15cms) lesions of stripped bark and at least six smaller ones, some only 2cms. It is impossible to tell for certain whether the hornets themselves initiate the damage or whether they have taken advantage of existing damage, but all strips show a characteristic nibbled edge where they have been at work. 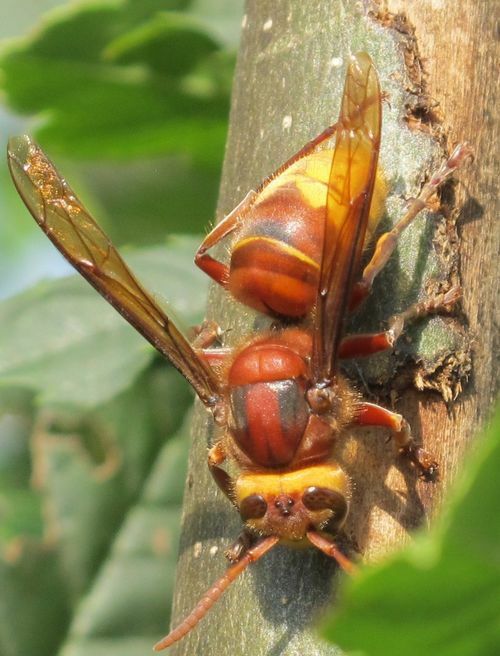 There are no signs of cuts or abrasions from other causes and, having watched one of the hornets vigorously having a go at a very small fresh lesion, I feel pretty certain that they are capable of starting one themselves without help. There have never been any more than seven hornets at any one time, or less than two. They have been there night and day, in all weathers. Individually, their visits to the hedge seem to last quite a long time, departures and arrivals are infrequent. It is odd that I have never seen any debris, that is pieces of bark, dropping from the nibbling insects. It is as if they are consuming what they are stripping. Are they carrying it back to the nest? But for what purpose? Hornet grubs are insectivorous, aren't they? Every now and then they stop stripping and appear to be sucking the sap. This (or something else) sometimes seems to make them behave as if they are a little drunk. Unsurprisingly, the sap runs attract other interested creatures, usually various flies, but one night I did find a moth, Angle Shades Phlogophora meticulosa. The hornets are quite tolerant of the flies and only show aggression if they get really close; a lunge is enough to scare off the intruder. I have never seen a wasp try its luck. This can't last. Either the farmer will strim the hedge or the first frosts will get them.